As concerns such as avian flu, animal welfare and consumer preferences impact the poultry industry, the reduced genetic diversity of commercial bird breeds increases their vulnerability and the industry's ability to adapt, according to a genetics expert. 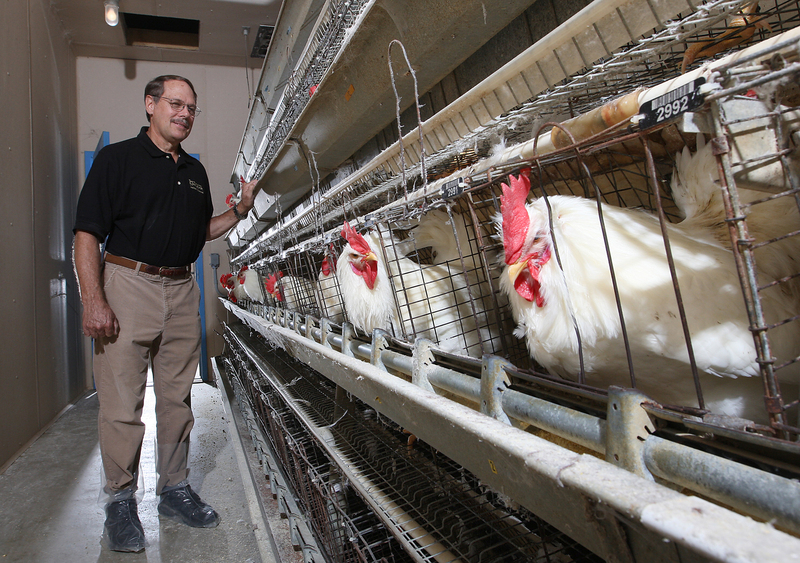 Purdue University animal sciences professor Bill Muir was part of an international research team that analyzed the genetic lines of commercial chickens used to produce meat and eggs around the world. Researchers found that commercial birds are missing more than half of the genetic diversity native to the species, possibly leaving them vulnerable to new diseases and raising questions about their long-term sustainability. "Just what is missing is hard to determine," Muir said. "But recent concerns over avian flu point to the need to ensure that even rare traits, such as those associated with disease resistance, are not totally missing in commercial flocks." He said it's also important to preserve non-commercial breeds and wild birds for the purpose of safeguarding genetic diversity and that interbreeding additional species with commercial lines might help protect the industry. The research, led by Hans Cheng of the U.S. Department of Agriculture, is in Monday's (Nov. 3) early online edition of the Proceedings of the National Academy of Sciences at http://www.pnas.org/papbyrecent.shtml. Historically, chicken producers selected birds for breeding based on certain desirable traits. Size was important for broilers, while egg production was critical for layers. Despite the fact that hundreds of chicken breeds exist, Muir said today's commercial broilers descend from about three lines of chickens, and poultry used in egg production come from only one specialized line. The research team included government, university and industrial scientists who conducted the study using the recently sequenced chicken genome. Obtaining DNA from commercial birds, they identified the number of alleles found throughout. Alleles are the genes that pair up to produce specific traits such as eye color. By comparing the commercial breeds with native and non-commercial birds, they found that commercial lines had lost up to 90 percent of alleles in some cases. "We suggest interbreeding some experimental commercial poultry lines with native or standard breeds as a backup plan, or ace in the hole, to help the industry meet future challenges, as traits such as disease resistance may be found among the rare alleles of other birds," he said. Muir said maintaining a healthy genetic reservoir in food-producing animals is crucial in order to protect the nutritional demands of a growing global society. Poultry is the leading meat consumed in the United States and in most other countries, with chicken meat production increasing by 436 percent since 1970, he said. Collaborators in the commercial breed analysis research included Cheng, Sean MacEachern and Huanmin Zhang of the USDA Avian Disease and Oncology Laboratory; Gane Ka-Shu Wong of the University of Alberta, Canada and the Beijing Institute of Genomics; Yong Zhang and Jun Wang of the Beijing Institute of Genomics; Martien Groenen, Richard Crooijmans and Hendrik-Jan Megens of Wageningen University, Netherlands; Ron Okimoto of Cobb-Vantress Inc., Arkansas; Addie Vereijken, Annemieke Jungerius and Gerard Albers of Hendrix Genetics, Netherlands; Cindy Taylor Lawley of Illumina Inc., California; and Mary Delany of the University of California, Davis. Breed utilization, genetic improvement, and industry consolidation are predicted to have major impacts on the genetic composition of commercial chickens. Consequently, the question arises as to whether sufficient genetic diversity remains within industry stocks to address future needs. With the chicken genome sequence and 2.8+ million single nucleotide polymorphisms (SNPs), it is now possible to address biodiversity using a previously unattainable metric "missing alleles." To achieve this assessment, 2551 informative SNPs were genotyped on 2580 individuals including 1440 commercial birds. The proportion of alleles lacking in commercial populations was assessed by (1) estimating the global SNP allele frequency distribution from a hypothetical ancestral population (HAP) as a reference, then determining the portion of the distribution lost, and (2) determining the relationship between allele loss and the inbreeding coefficient. Results indicate 50% or more of the genetic diversity in ancestral breeds is absent in commercial pure lines. The missing genetic diversity was a result of the limited number of incorporated breeds. As such hypothetically combining stocks within a company could only recover pre-existing within breed variability, but not rarer ancestral alleles. We establish that SNP weights act as sentinels of biodiversity and provide an objective assessment of which strains are most valuable for preservation of genetic diversity. This is the first experimental analysis investigating extant genetic diversity of virtually an entire agricultural commodity. Methods presented are the first to characterize biodiversity in terms of allelic diversity and to objectively link rate of allele loss with the inbreeding coefficient.